Magic University “Christmas Magic” Excerpt! Some of you have been asking me what the bonus novella in the Magic University digital box set is like. I figure the best way to answer that question is give you all a little taste! But note! SPOILER ALERT! The novella takes place AFTER the series, so you really need to read the series first before you understand what’s going on here and why it matters. “Yes, but I’m also the best ritual designer and that was supposed to be my role on the team.” I look out the window at Harvard Yard but there is no help from that direction either. “And I told you, I can’t perform conjuration well without… a lot of preparation.” My hesitation is not because I am telling a lie, though I am not telling him the whole truth. The reason they all think I’m such a top-notch conjurer is I used to have power to spare. It used to practically ooze out my pores. Ever since The Storm, though, my situation has been decidedly different. I check the time. Half past three. The first of December. That means we’ve only got about forty-five minutes of sunlight left. Through the wavy, ancient glass of the window I make out a welcome, familiar figure. “Call you back in an hour,” I say to Tristan. “I’ll let you know. One hour.” I hang up and rush out the door to greet Kyle on the walkway, despite the fact I’m not wearing a coat and it’s nippy out. “Sort of,” I say. “Can we hurry upstairs?” I tug at his belt loop and lick my lips and he gets the idea of why I want to be alone. Up in the attic dorm room I have to myself, I start stripping out of my clothes the moment the door shuts. Only available until Feb 1st! 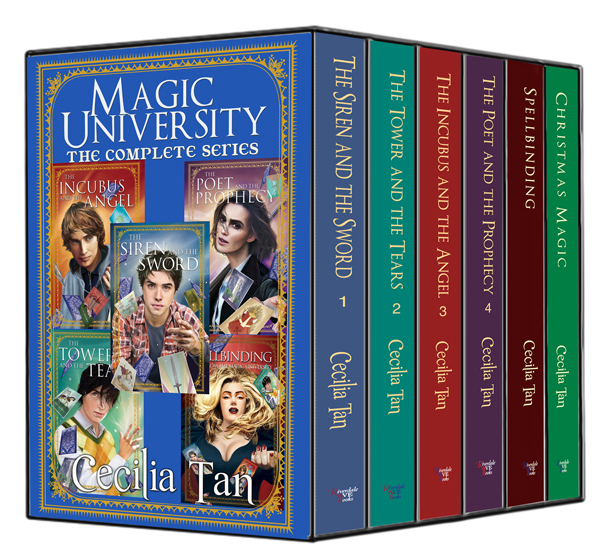 The Magic University Box Set is now live!